- Grotte Scurati-Scurati Caves, including the famous Grotta Mangiapane which takes its name from the family which lived there in tiny houses from 1819. About 60 metres high and 70 deep, it was used by man from Upper Palaeolithic times, as shown by the relics found inside. The cave and the space in front of it make a suggestive natural frame for two events of great ethnographical and anthropological interest: il Presepe vivente - the Living Nativity Scene which takes place at Christmas time and the Museo vivente - Living museum, in summer. Domestic and working scenes, decorated with original furnishings recreate life in an early twentieth century country village while men and women, using tools, demonstrate trades and activities of olden times. - Grotta Buffa-Buffa Cave (about 50 metres from the previous one, towards the village of Cornino) with a height of about 60 metres above sea level., it is made up of a large ogive long, pointed room (4m wide and 23m deep). Inside there are fossils and lythic material dating back to the Palaeolithic age. - Grotta del Crocefisso-Cave of the Crucifix (reached through a path along the side of Mount Cofano) is so called because it is above a small chapel (capella del Crocefisso). It is formed by a long, pointed corridor (6m wide and 23m deep) which widens towards the interior in a narrow, horizontal tunnel. - Grotta Miceli-Miceli Cave (towards the village of Scurati) it is made up of a circular cavern about 40m above sea level, about 5m wide and 12m deep. - Grotta Maria di Custonaci-Maria di Custonaci Cave, The largest of all the caves, at 150m above sea level, situated in the valley of the Zubbia ridge. At about 60 metres from the entrance, two routes present themselves: one which leads to a level with stalagmites, the other to a terminal cavity known as Caverna Bianca- White Cavern. 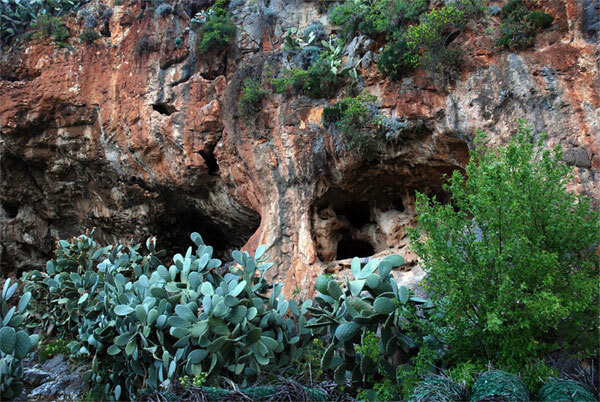 Other natural caves can be found in Rocca Rumena.